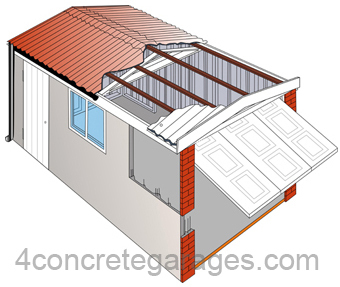 The Lidget Compton Premium Options Package offers great value for money in a maintenance-free and secure attractive concrete garage. The Lidget Compton Premium Options "PO" package is a convenient all in one Special Offer Package offering unique looks, security and maintenance free components to your concrete garage. Based on our Standard Apex corrugated roof, firstly a coloured roof is added plus PVC fascias, window and barge boards, then true brick front posts and a proportionate width Georgian door design with four point locking. Similarly our Deluxe garage package is another great opportunity to enhance your Lidget building with added value. Like the Premium Options package a coloured roof, Georgian style main door, steel access door, uPVC fascias and imitation brick pillars are supplied simply the PVCu window is a fixed type and steel pedestrian door vertical rib not panelled designs. Both garages include an internal sand/cement fillet in order to prevent water seepage and every Compton apex building is mastic sealed throughout and includes eaves fillers.